The two-way relationship between tropical cyclones over the Bay of Bengal in late fall and stationary Rossby wave propagation along the Asian jet is examined using the Japanese long-term Re-Analysis project (JRA-25) and the Japan Meteorological Agency Climate Data Assimilation System (JCDAS) data. As a precursory signal of the maximum development of the tropical cyclones migrating northward over the Bay of Bengal, a stationary wavetrain pattern prevails from the Mediterranean to the western Indian subcontinent. A cyclonic circulation anomaly to the northwest of the Bay of Bengal, which is part of the wavetrain pattern, facilitates the northward migration and enhancement of the tropical cyclones over the Bay of Bengal through the change in the mid-tropospheric mean flow and the equatorward advection of higher potential vorticity, whereas those cyclones can in turn give rise to the downstream development of the stationary Rossby wave packets along the Asian jet. Such a teleconnection further triggers surface cyclogenesis in the vicinity of Japan by leading to the intrusion of higher potential vorticity in the upper troposphere toward the Japan Sea. 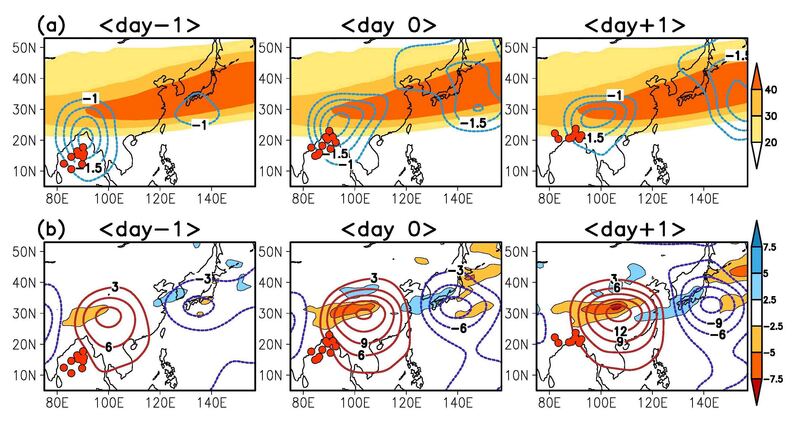 Hirata, H., and R. Kawamura (2013): Remote forcing and response of tropical cyclones over the Bay of Bengal to the Asian jet variability in late fall. SOLA, 9, 27-31. Fig. 6 (a) Composite maps of filtered 250-hPa velocity potential anomalies form day -1 to day +1. The contour interval is 0.5×10^6 m2 s-1. Anomalies of greater than -1.0×10^6 m2 s-1 are suppressed. Day 0 denotes the maximum developing day of BOB cyclones. The location of BOB cyclones identified by best track data is shown. Climatological November mean westerlies at 250-hPa are also exhibited. The shading interval is 10 m s-1. (b) Composite maps of filtered 250-hPa stream function (contour) and Rossby wave source (color shade). The contour and shading intervals are 3.0×10^6 m2 s-1 and 2.5×10^-10 s-2, respectively. The zero contour is suppressed.